a southern local board that conforms with the present Dairy Flat and Kumeu subdivisions, of the current Rodney Local Board. in anticipation of population growth in Warkworth, in what Auckland Council has deemed to be one of two satellite growth centres in the rural Auckland region. Mahurangi Action further applies for consideration of the name Tamahunga to be used for the proposed north-Rodney local board. Finally, Mahurangi Action applies for a moderate amount more power to be shared with the local boards by the governing body of Auckland Council. increase the power of local-boards to provide effective representation. Mahurangi Action believes that residents of north Rodney would strongly relate to a north Rodney local board, particularly if meaningfully consulted about a unifying name for the local board area. The sense of alienation resulting from the forced amalgamation, exacerbated by the Northern Action Group’s dogged pursuit, first of union with Kaipara District Council, and then as a separate unitary authority, is unconducive to good local government. The creation of a new local board, and one that, along with the other local boards, enjoyed a moderate amount more power than local boards currently are allowed, would send a strong signal to the people of north Rodney that their communities are recognised as having distinctly different issues and needs from the balance of the Auckland region. From the commencement of the royal commission process, Mahurangi Action and the Mahurangi Magazine have engaged in an open-minded exploration of as to how Auckland region’s governance could be improved. Included in the 30 Mahurangi Magazine articles published was the draft of this alternative application. Mahurangi Action’s formative experience, and indeed the proximate driver for founding the organisation in 1974, was an example of the need for regional governance. The then Warkworth Town Council was pursuing a localised wastewater treatment solution when it was clear to others, including the special water board tribunal that considered the water right application, that a system that included nearby Mahurangi coastal settlements was preferable, including in respect to safeguarding Mahurangi Harbour oyster-farming operations. That a legal loophole was exploited by the town council to go it alone then, and that the current proposal of Watercare, 42 years later, is for a combined scheme, only goes to illustrate the need for comprehensive regional governance. The 10 years of scientific surveys of the Mahurangi Harbour’s benthic communities leading up to 2004, and the Mahurangi Action Plan that those studies spawned, were initiated by the Auckland Regional Council and continue under Auckland Council, without which the harbour would have received no help in addressing its sediment accumulation rate, double that of other Auckland catchments. These three examples, of course, are not a definitive list of regional governance needs, which would include transport and residential planning, to name two of the more obvious. Auckland’s regional governance practice dates from the establishment of Auckland Regional Planning Authority in 1954. Then came the Auckland Regional Authority, with its built-in provisions for the purchase of regional parks, beginning with Wenderholm 50 summers ago, followed by the Auckland Regional Council in 1989, and culminating in the region being constituted a unitary authority, Auckland Council, in 2010. After 62 years of progressively building robust regional governance, and with a population more than three and a half times greater, the Northern Action Group notion that the Auckland region could somehow dispense with regional governance is risible—north Rodney, overnight, would become an unfettered developers’ El Dorado, à la Mangawhai and its attendant governance debacle. Shared service arrangements should be considered as an alternative option to forced council amalgamations. The application by the Northern Action Group is unabashedly dogma-driven and wholly without merit as a governance model for an area that is totally in the thrall of New Zealand’s dominant conurbation of Auckland—home to one third of New Zealanders. With significant numbers of residents commuting from north Rodney, and even from Mangawhai north of the Auckland Council boundary, it is clear that functionally, north Rodney is part of the Auckland region. The massive, undisclosed and on-going cost of creating one unitary authority from one regional and seven city and district councils would be greatly added to, was part of the region to be now split off and another new unitary authority created, before the new governance arrangements have been fully bedded in. While it was the democratic right of the Northern Action Group actors to oppose Auckland region unification, and to agitate for secession once it occurred, the majority of north-Rodney residents, and organisations such as Mahurangi Action, have been working diligently to obtain the best results from the new structure. As Mahurangi Action stated to the royal commissioners, the time for providing the citizens of the Auckland region with a poll should have been once the commission had identified a number of robust options for the governance of the region. If a poll is now to be held, it should not be held as in response to the piecemeal Northern Action Group application, but should follow a commission of inquiry held say in 2025, allowing a five-electoral-term stabilisation period, provided there was a region-wide public consensus for one. Next in line include South Kaipara Head, Tāwharanui Peninsula, and Cape Rodney. 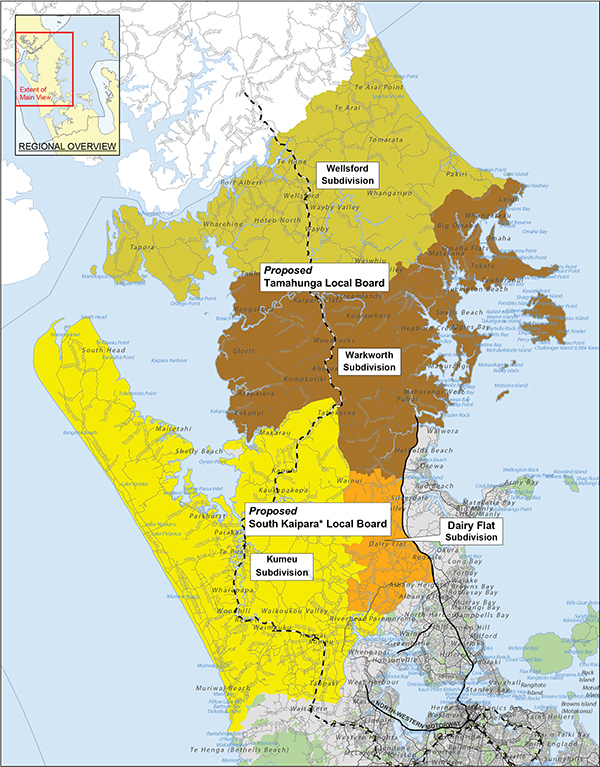 If the Rodney Ward is to have two local boards, the southern local board connection to Cape Rodney would be tenuous in the extreme, making Kaipara or South Kaipara a more natural, and geographically coherent choice. In the proposed north-Rodney local-board area, Mount Tamahunga has a stronger geographic dominance than does Cape Rodney, which shares its coastal-sentinel role with the four-kilometre farther easterly-jutting Tāwharanui Point. Mahurangi Action commends Tamahunga as a name for a new local board, which would have an implicit mission to represent Aucklanders north and south the Tamahunga Range to the best of its ability and to engender a sense of shared community in the Auckland region’s north. The Rodney Ward, with its population of only about 55 000, is currently the best represented ward in the Auckland region. In contrast, the Waitematā & Gulf Ward, which, as its name suggests, includes Waiheke and Great Barrier Island, is the least, with Councillor Mike Lee currently representing more than 86 000 people. Without doubling the number of councillors to 40, Mahurangi Action can see no democratic way that the present Rodney Ward could be split into two and allowed two councillors, as applied for by the Kumeu–Huapai Residents and Ratepayers Association. Not only would the proposal would give Rodney people three times the representation allowed Waitematā & Gulf Ward residents, it would result in a governing body of 22, which would increase a mayor’s opportunity to cast two votes. Sixty-two years of regional governance has seen the growth of regional services greatly valued and enjoyed by Aucklanders, including a network of regional parks that ensures that inhabitants of the metropolis enjoy similar levels of access to wild places that the balance of New Zealanders, with their typically closer proximity to national parks, enjoy. Any breaking up of the region now—de-amalgamation—would be an historically retrograde step, unless it was accompanied by the reintroduction of a regional tier of government. In its final submission to the Royal Commission on Auckland Governance, Mahurangi Action supported the model proposed by the then Auckland City Council calling for ‘a menu of options’ for representation at the neighbourhood level. This might have seen, for example, council-supported forums Wellsford- and Warkworth-based, serving that part of the region north and south respectively of the Tamahunga Range. all local boards to enjoy a moderate amount more power than they are currently allowed.